The brand with a crown takes the lion’s share at the Christie’s auction on 12 May in Geneva, estimated at CHF 15 million*. The top lot remains the preserve of Patek Philippe which is also celebrating its 175th anniversary this year. With the departure this winter of Aurel Bacs, head of the watchmaking division at Christie’s, management of this department has been jointly entrusted to John Reardon (based in New York) and Sam Hines (based in Hong Kong). The latter will take charge of the organisation of the Geneva sale, from where Nathalie Monbaron takes a look for GMT readers at preparations for this next big event. While Christie’s management team has not noticed a major change in the watchmaking auction market overall, the demand for replica Rolex watches in particular has been regularly increasing recently. The famous sale in November 2013 for the Daytona’s 50th anniversary merely accentuated this trend, reaching a figure four times that of the original estimate with a total of more than CHF 12 million for the 50 Rolex items sold. In the wake of this success, cheap replica Rolex constitute the majority of the 450 lots offered on sale in May on the banks of Lake Léman, despite a tough selection process designed to maintain only models in excellent condition, and governed by a desire not to inundate the market. Two remarkable collections are underpinning the Rolex fake watches section of the sale and are likely to result in some passionate jousting. 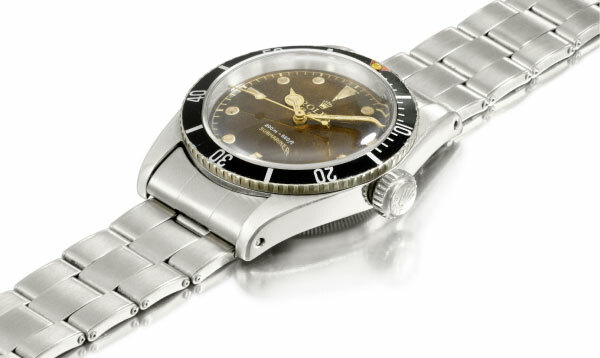 Mainly devoted to sports copy Rolex watches, the first includes rare and particular models, and notably a Reference 6238 with a black dial (estimated at CHF 50-70,000.-), a Reference 6538 “big crown” (CHF 80 – 120 000.-), a Reference 6036 with a triple calendar (CHF 120-180,000.-) and even a Sea-Dweller Reference 1665 bearing the signature of the Sultan of Oman. The latter is in fact the theme of the second collection, made up of a dozen of models all bearing the signature Qaboos or his coat of arms on the back or the front, represented by the khanjar. 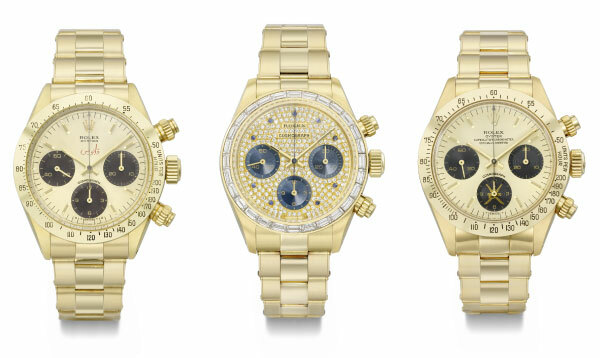 The collection of the Sultan Qaboos Bin Said Al Said of Oman is notably distinguished by a Day Date in platinum with a diamond-set bezel, featuring the khanjar emblem on the dial, but above all by various Daytona models : a Reference 6265 in yellow gold with the khanjar in a subdial (CHF 140-300,000.-) ; another with the Qaboos signature (CHF 240-500,000.-) ; and undoubtedly Rolex’ top lot, a Reference 6265 in yellow gold with diamonds on the dial and baguette-cut diamonds on the bezel (CHF 460-800,000.- ). Fans will definitely fight over the Padellone Reference 8171, put forward in spectacular condition by a European collector (CHF 120-250,000.-). Meanwhile, the star lot at Christie’s spring sale in Geneva is a Patek Philippe Minute Repeater in platinum ordered in the 1920s by Henry Graves, the famous banker and collector. 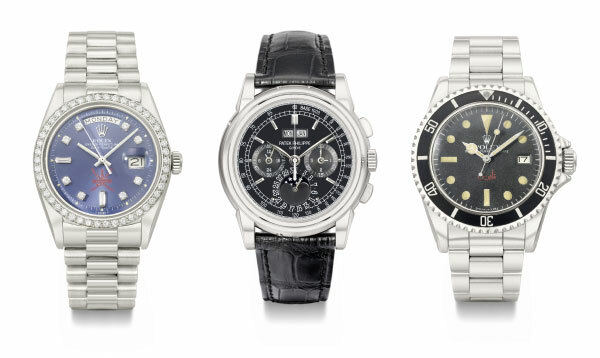 Each watch from his collection provokes a fresh spate of sky-high bidding. In this instance, the only other known example of this model is in the Patek Philippe Museum, and it is estimated at between CHF 1.2 to 1.8 million. Still in the domain of Patek Philippe vintage models, and in particular one already sold by Christie’s in 2007 for a little under a million Swiss francs, this 1940s Reference 1518 in yellow gold is the only model on which the inscription “calendrier perpétuel” appears above the apertures. For fans of yellow gold bracelets, which are quite rare at Patek Philippe, this Reference 2499 3rd series is estimated at between CHF 250 and 350,000.-. Amongst the modern items, it will probably take double or triple that amount to acquire a Sky Moon Tourbillon in yellow gold by the Fine Watchmaking cult brand, or else bidders may decided to settle for the A. Lange & Söhne Pour le Mérite in white gold (CHF 150-200,000.-). As is usually the case at Christie’s sales, a large number of modern lots broaden the range of the brands represented, with or without a reserve price. The pocket watches feature a fine selection of high quality pieces, including a Breguet tourbillion regulator estimated at between CHF 600,000.- and 1 million, or a Patek Philippe with an enamel scene depicting the Swabian War by Martin Bischoff. Whether to begin or enrich a collection, there is something for every mechanical taste in the shape of models from across the decades and around the world.